Live Channeling Event Day 1! Bashar has said, many times, that you can experience positive meaning from any circumstance. In “The Seven Neutral Needs”, he gives a new depth of understanding to this idea and how it may be applied. By learning to find the core neutrality in any given situation, you can be at choice about whether to perceive it positively or negatively. This session will assist you in becoming very clear about how to respond so you can stay in the moment and experience an empowered and exciting life! Live Channeling Event Day 2! Single day tickets not available to live channeling event. 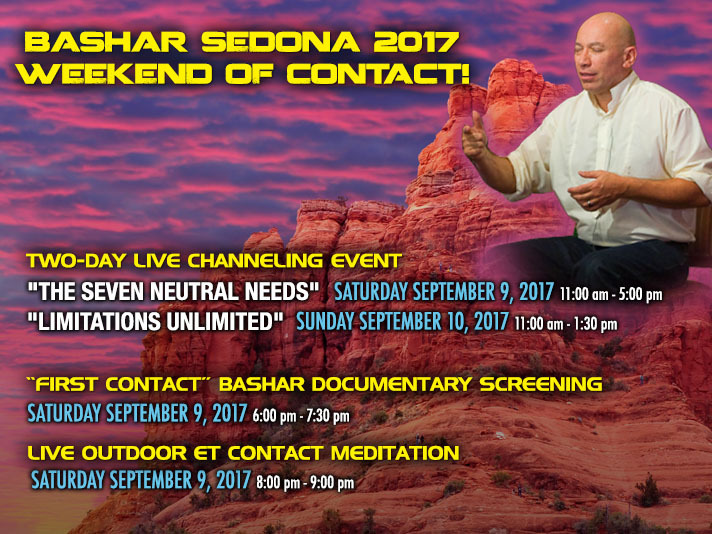 Bashar Contact Meditation – Live! Hear more about the channeling event! Hear more about the meditation! All event times based on Arizona Time Zone.